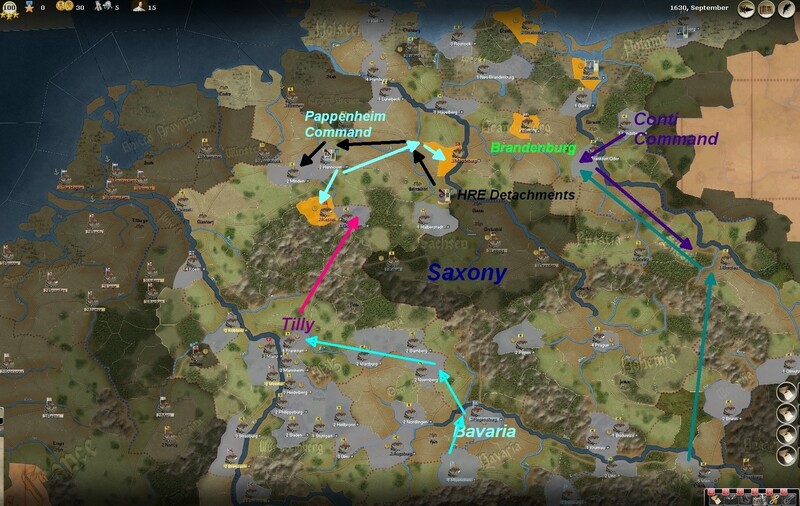 At the start of the scenario Conti corps garrisoned in Landsberg east of Brandenburg region. First task is to move his stack to a safer location, Frankfurt Oder when he is unlocked after 2 turns. By the time there is risk of an attack he’ll fall back deeper to the south immediately. Imperial detachments south of Magdeburg move to Minden and wait for Pappenheim corps to unlock after 7 turns. Supply situation may necessitate building depots in both regions. Kassel and Magdeburg will be immediate priority for launching attack before Swedish army improve their supply quality. 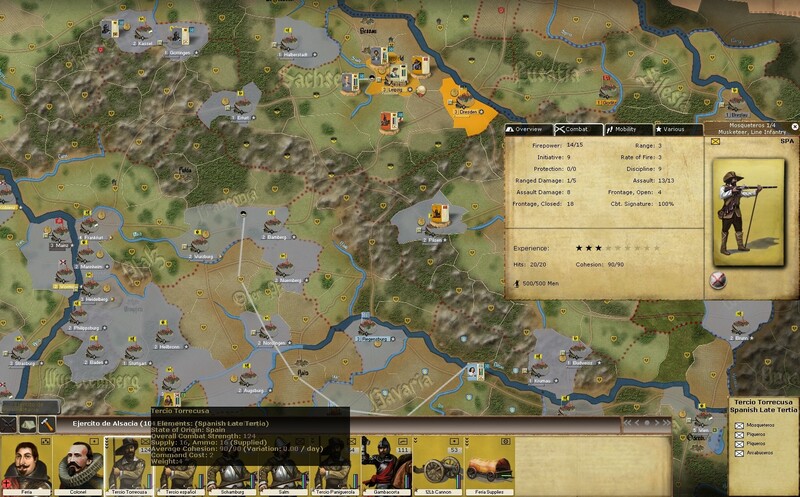 Those cities necessary for delaying Swedish army and protecting Brandenburg region in early campaign. In the north, Elbe river between Hamburg and Lunebeck permits passing through. Any troop stationed or move through there will be possibly isolated. When Tilly and his troops arrive in Frankfurt they will station for a while and wait for Bavarian recruits from Regensburg, Munchen. Tilly by himself can march and merge with Conti corps to improve supply quality in Frankfurt Oder which is not sufficient. 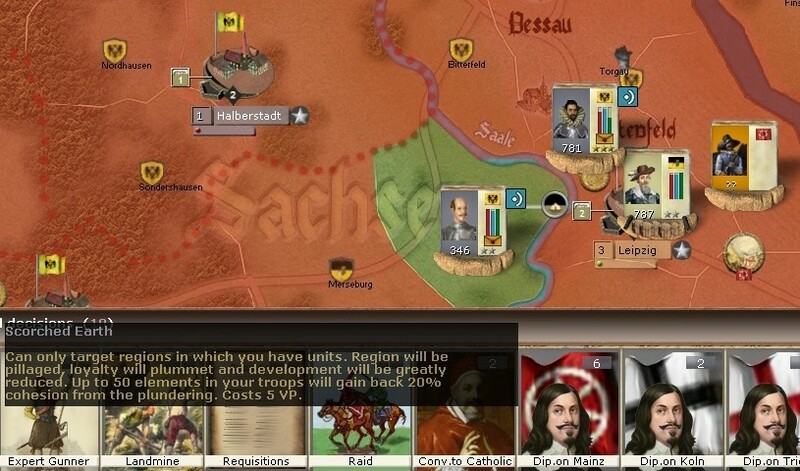 From option panel there will be raider cavalry recruits from Wien to harrass and pillage unprotected cities of the enemy. As the supply situation may not be yet sufficient for Swedish, already pillaged regions may prevent economic gain from it. I’ll be using Raid RGD when there is an opportunity to do so. 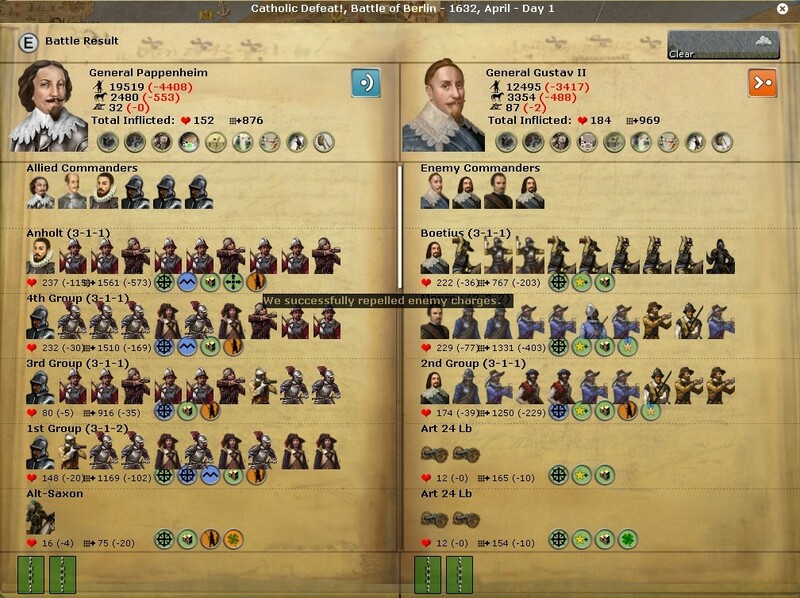 Ebbingford wrote: Swedish Intervention opening background and scenario notes for the Protestants. 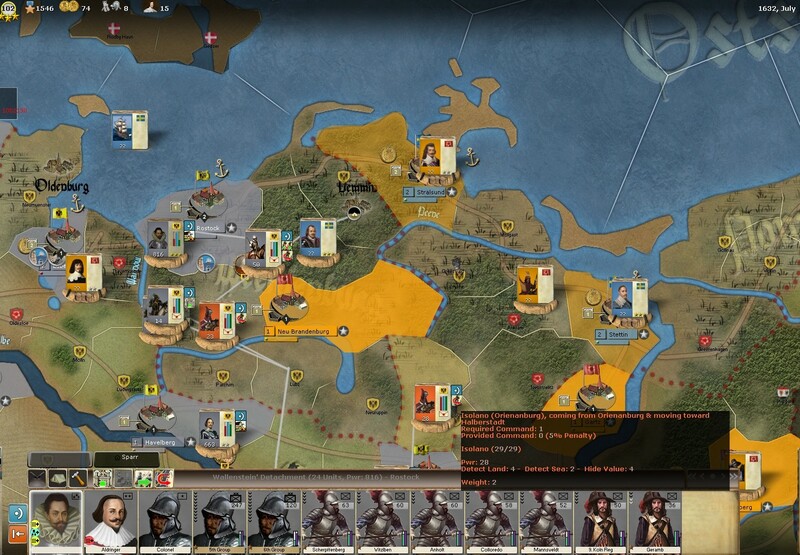 The Swedes start this scenario with a lot of under strength units, my first task is to build a depot in Stettin and then get these units up to full strength. 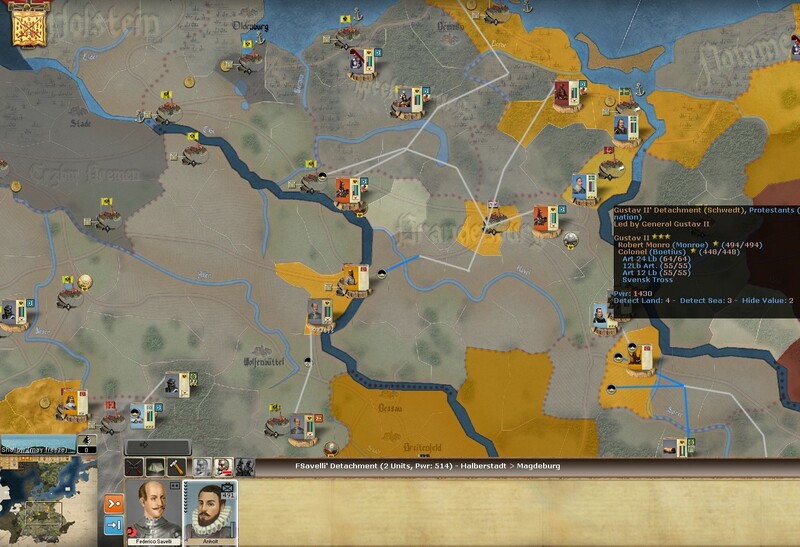 In early game according to the plan taking control of Göttingen, Kassel and Magdeburg was crucial. Unpredictable success was Berlin captured earlier. It did encourage moving large force to protect Berlin; Brandenburg region. From Frankfurt new recruits, artillery and supply wagons dispatched immediately in the vicinity of Pappenheim force. Kassel surrendered and Kolberg under control of Swedish army after long siege. Swedish army lay a siege to Neu Brandenburg. By the time Savelli force march to battle city was surrendered already. 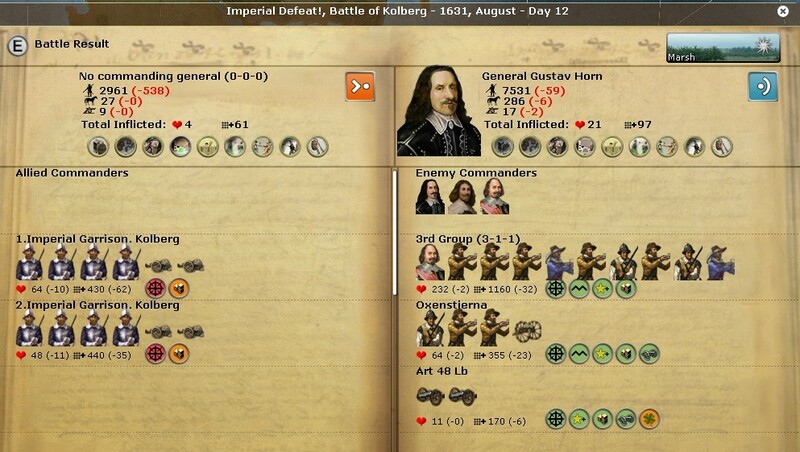 It was unlucky defeat for HRE. Pappenheim marched to Berlin and started to build entrenchments while Tilly stayed idle to bring his force when necessary. 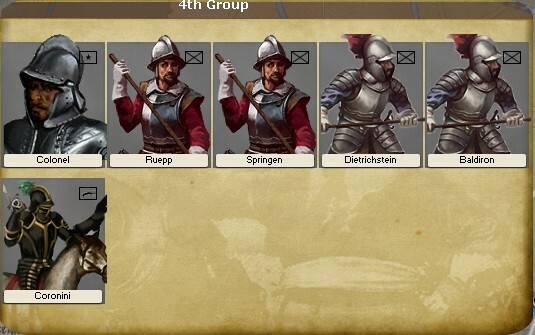 All unit models consume some portion of War Supply for replacement and recruitment. Through long war it is important to keep sufficient WS. Regional decisions such as contribution maintain WS from cities with a loyalty loss. With war exhaustion through late game it is possible to build cheaper and weaker light infantry models without WS requirement. Winter quarters in Berlin with additional level supply depot building put on hold with Gustav attack in April 1632. 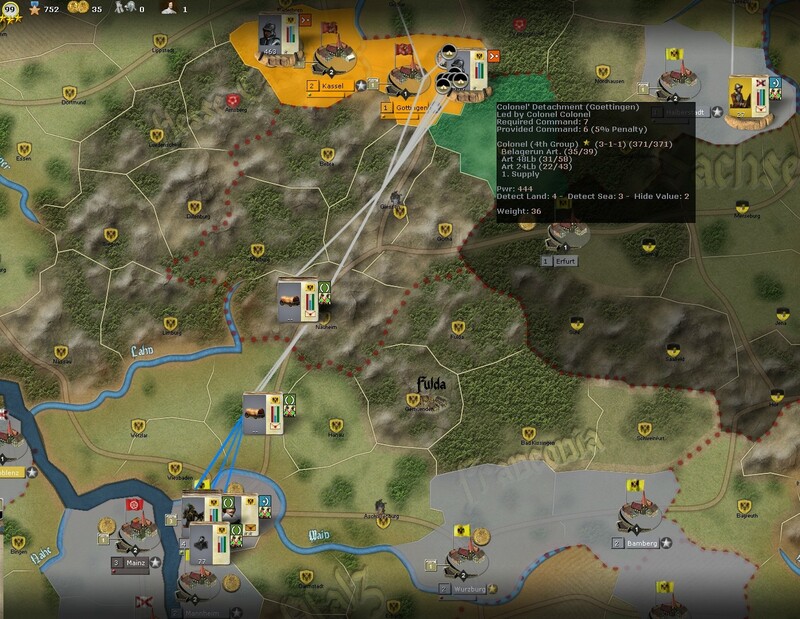 Pappenheim force defeated in battle but didn't retreat. 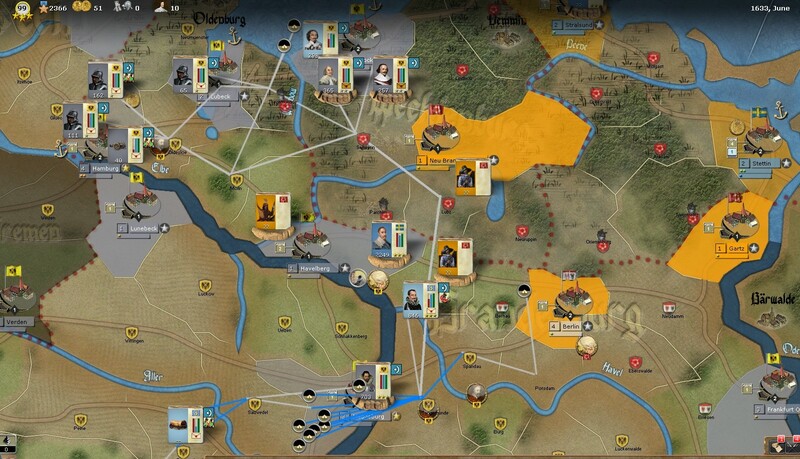 Tilly immediately reinforce the region without taking supply wagons and artillery with him not to slow him down.. But that battle was also failure. 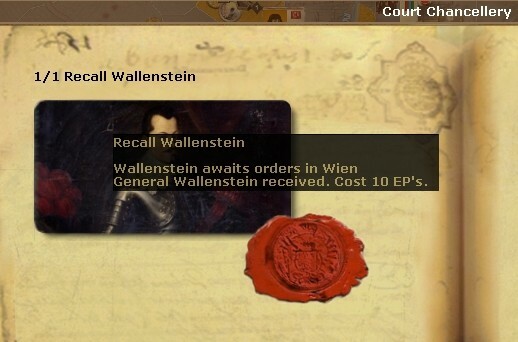 Wallenstein recalled to command, he was going to lead troops in Havelberg for following threat in Rostock. Garrison was under siege and navy put blockade to the city. 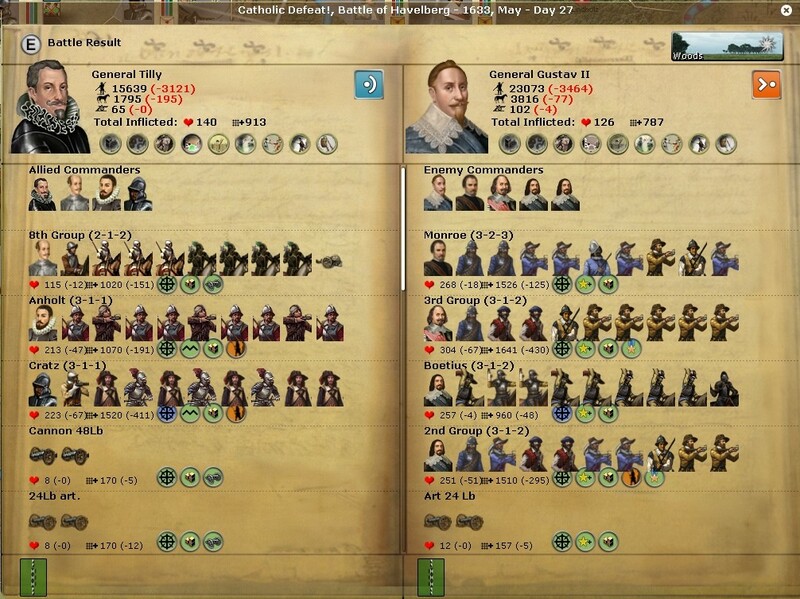 Garrison sally out before Wallenstein attack. Enemy retreated to adjacent region. 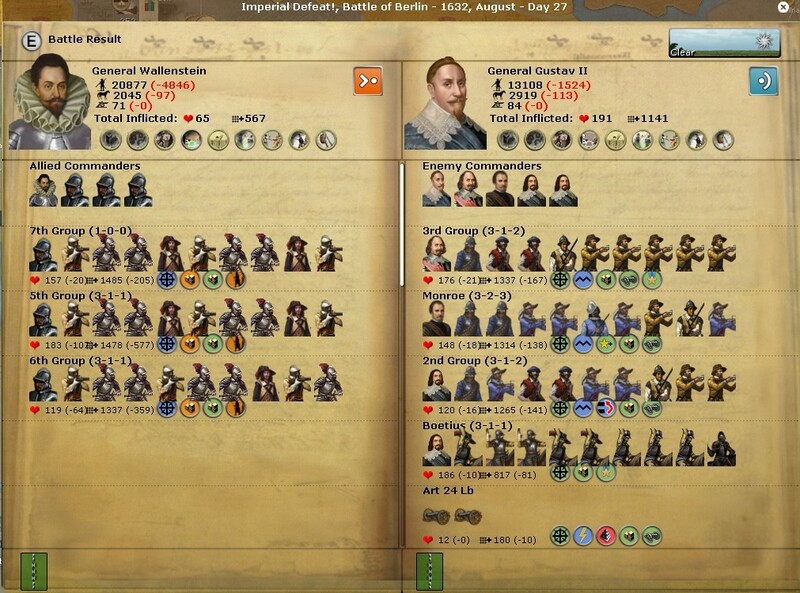 Tilly waited in Berlin for Wallenstein support. 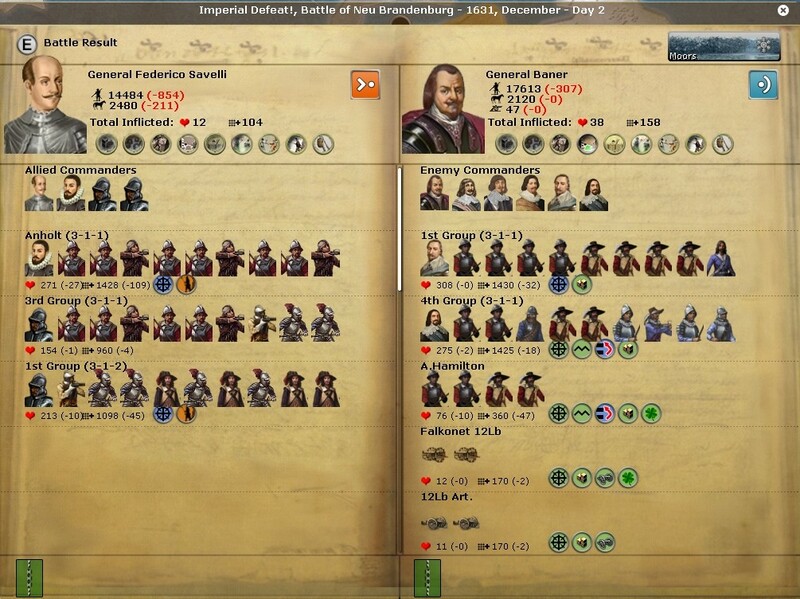 Battle started 8th of August and Wallenstein join in 27th. Both retreated to north of Berlin. It was time to split. 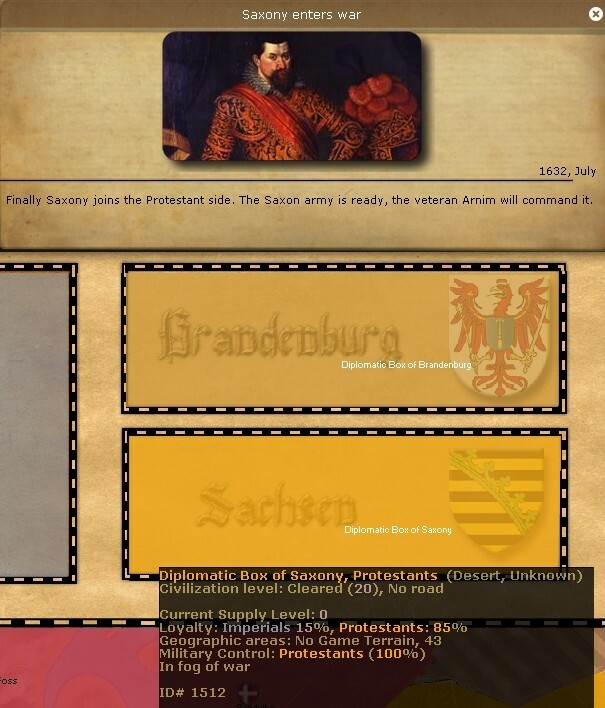 Tilly would stay in Brandenburg and Lower Saxony while Wallenstein will move to confront with the new enemy, Saxony..
thanks for starting this. Must say, the game visually looks gorgeous. Graphics very pleasant to look at indeed. 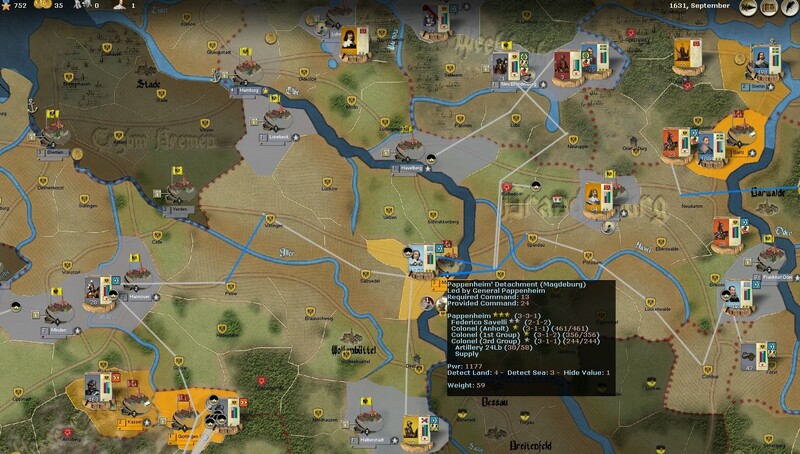 This game primarily uses same supply rules as in WIA that units get supplied in a region basis, countryside also providing limited supply depends on loyalty. I can say attrition levels can be quite high in winter movement. Coupled with historical attrition it is hard to replace loses as in ROP, necessitate winter quarters. One difference there is no MTSG as in ROP. Maybe it shouldn't be in ROP anyway. And much harder to supply big stacks in cities. Replacement of units need further WS and that is hard to have enough of it. 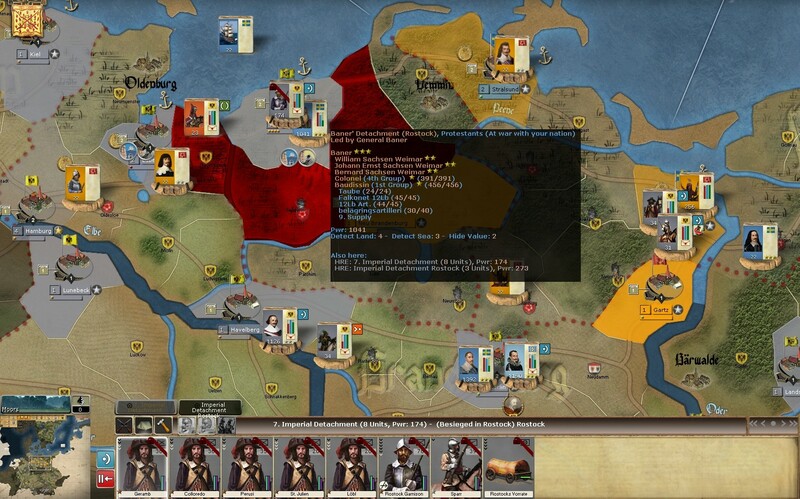 As for us long campaign pbem players it has good material about multiple but less organized armies, diplomacy and RGD cards can change throughout the game. Oh, this will be excellent. 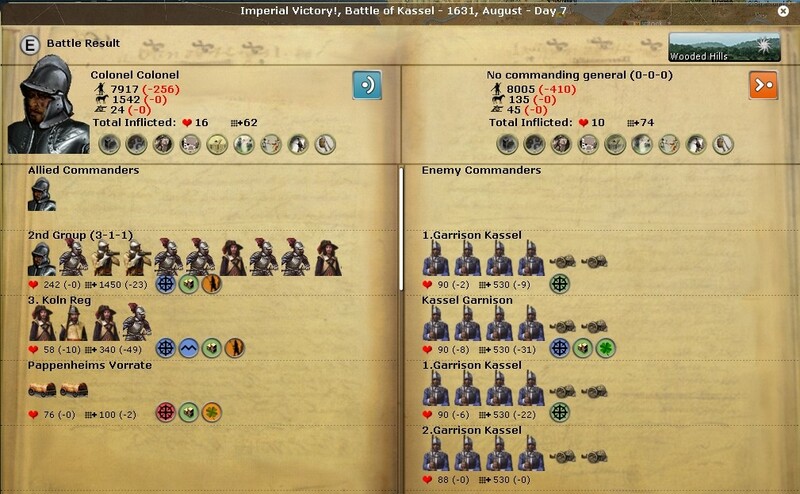 When Baris does an AAR, sit yourself down and grab some popcorn and be prepared to be educated, entertained, and amazed. Yes, I have the game and I have to say no offense to other titles, but the artwork in this game is the best so far. I give enough spoilers to my opponent as well. I suppose I would play differently next time, but good learning scenario overall and all game options are available from the beginning. Baris wrote: Thank you H Gilmer. I have been reading yours, Loki's, and Narwhal's AARs for about 6 years now. They are always a learning experience. Location: Staunton, Virginia, United States. It was mentioned above that the supply rules and attrition effects in this title are similar to WIA. When I played WIA the AI loved to march around in the winter and the troops melted away. Will the AI in this game behave better in the winter? Supply in WIA uses the same system named ‘simple supply rules’ (not free supply as in the game option) such as in here and AJE but with a main difference elements gain strenght points (not new elements) automatically according to the excessive supply they have in a region with a structure. Where as in here strenght points and lost elements replenish according to correct replacement chits type and as long unit is not isolated. Overall in some region recovering strenght can be more difficult in WIA. There can be tough choices plus AI is less advanced as it is older game. 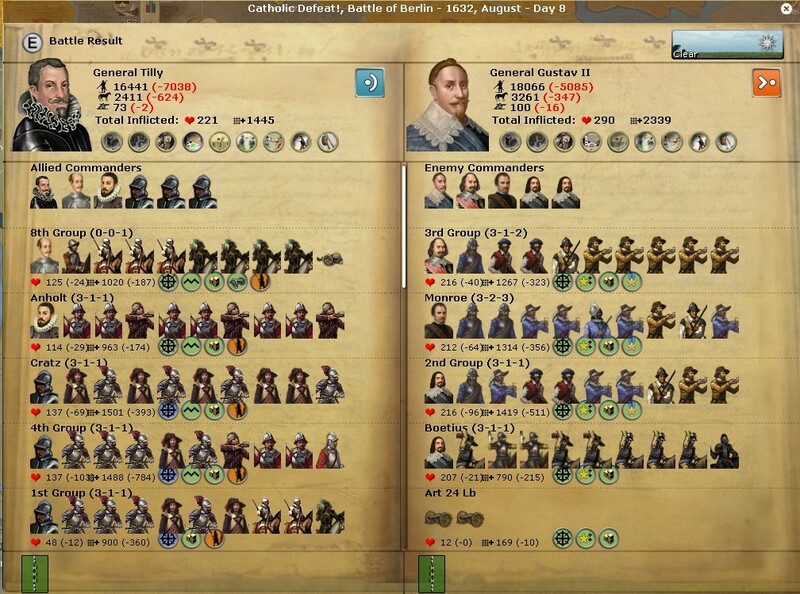 AI generally can perform better with less sofisticated army structure. 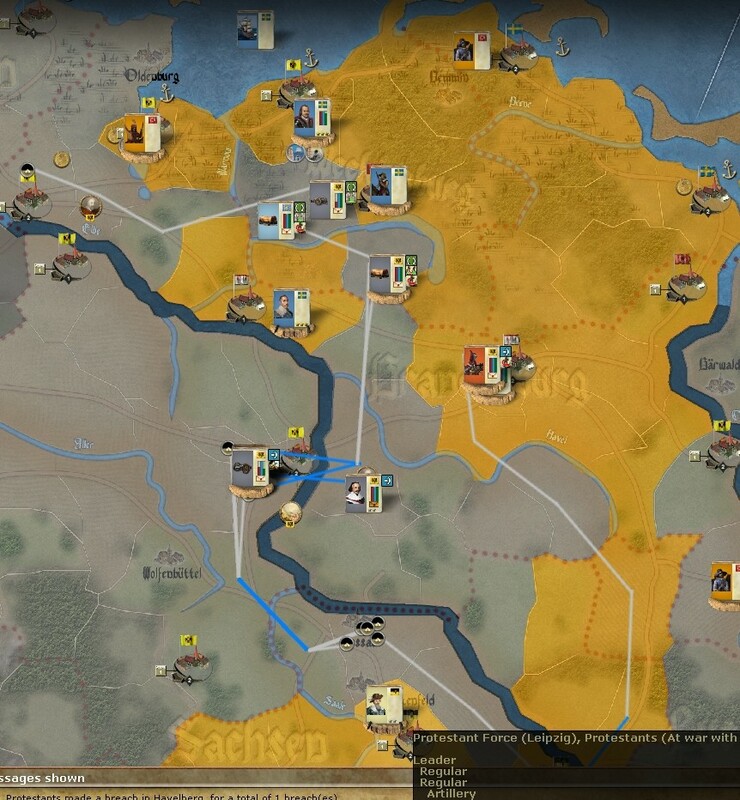 I find ROP AI very good especially with 4 player scenario picking Prussia, it can be a challenge even it is an earlier version. 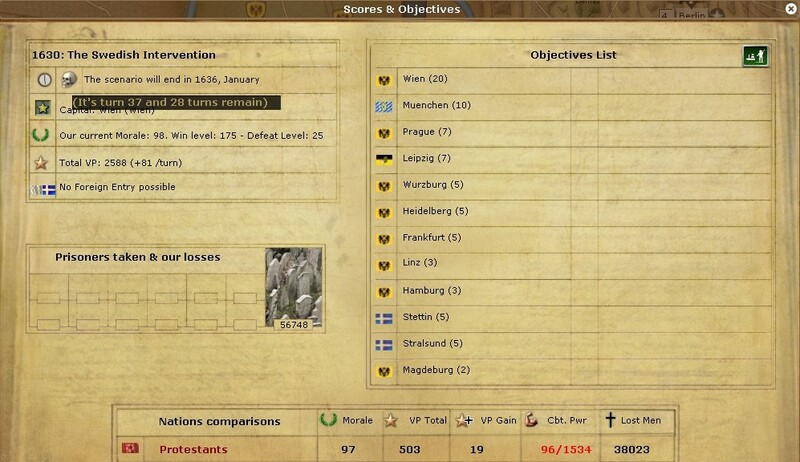 In this game AI can succesfully form full groups and march&attack according to odds with correct detection settings. 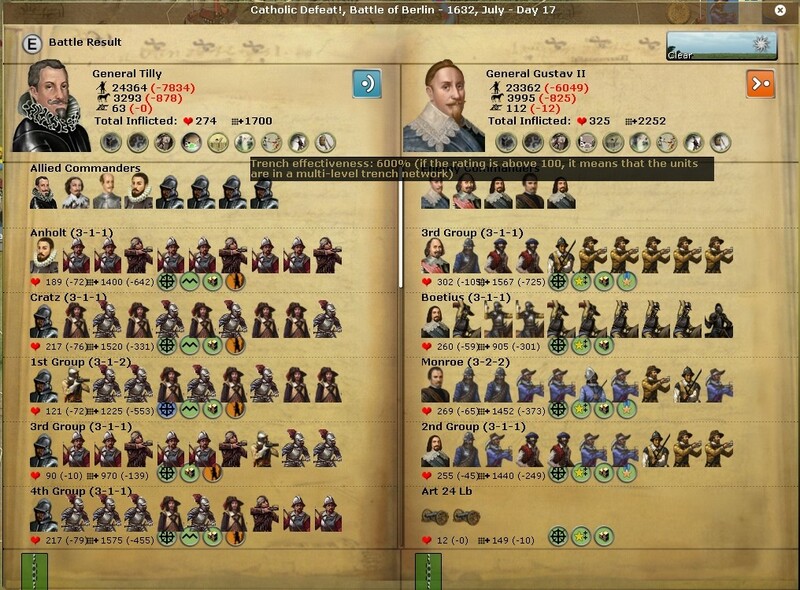 In my game vs HRE AI after successfully defending Prague game went on until 1627 that I didn’t see obvious mistakes under normal difficulty level. 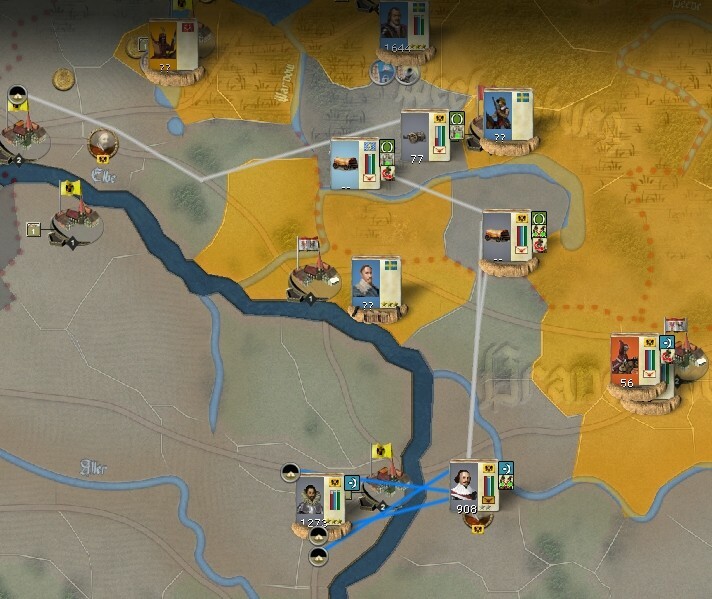 While attacking Prague I saw many instances of correct movement by not attacking directly from south region, going instead east of the city to attack from there where there is no river in between. But major rivers can handicap movement and zone of control can give hard time even to players vs AI such as in Linz, Budweiss. After quite winter Gustav attacked in spring west of Berlin through Havelberg. 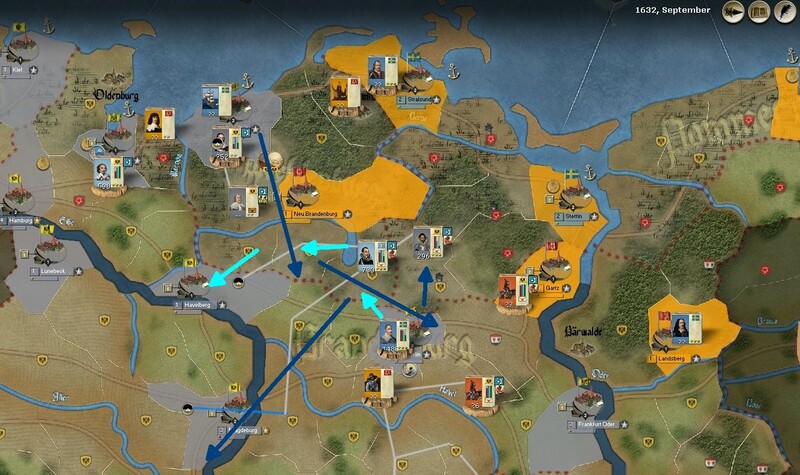 Tilly force retreated south and quicky move to Magdeburg. All the other forces in the northern theater did a full retreat where Wallenstein force located. Some supply wagons and artillery were attacked by raiders. Wallenstein arranged 3 groups and siege artillery units to attack Saxony while Tilly started to form defensive positions in case of Gustav's further attack. How goes it, my fellow HRE'er? It was all retreat in the following turns. Gustav attacked Tilly in Magdeburg and defated him. 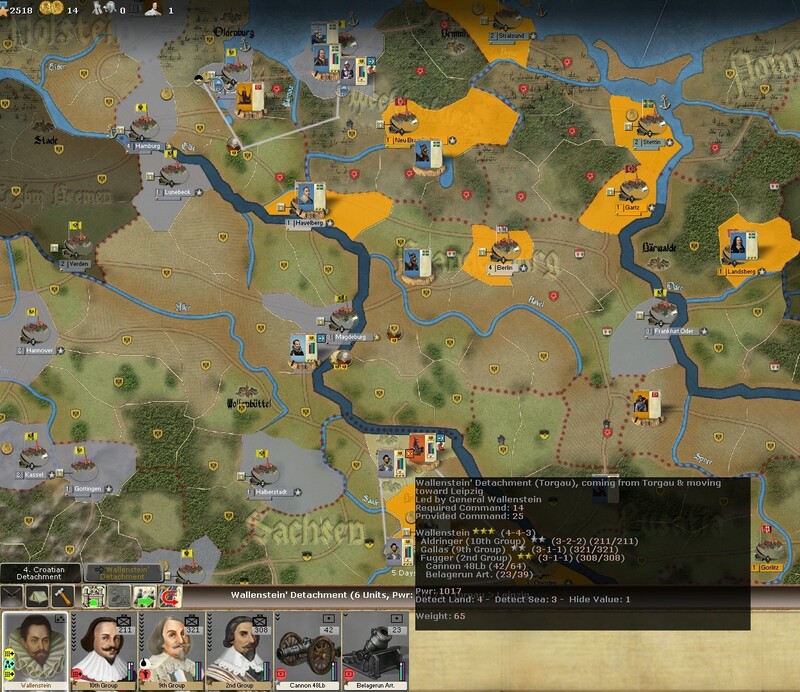 I then decided to attack Saxony if Tilly would take them down in Leipzig but It didn't work. Did try with Wallenstein reinforced with newly arrived mighty Tercio but he was very low in supply. Naturally all units have very low rate of fire in that turn. 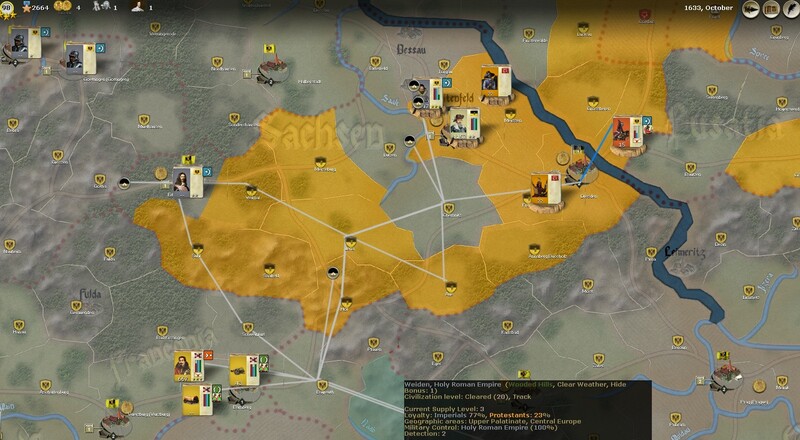 Second defeat from Saxony that's where winter attrition kicks in when moving to safer location with low supply in harsh weather. 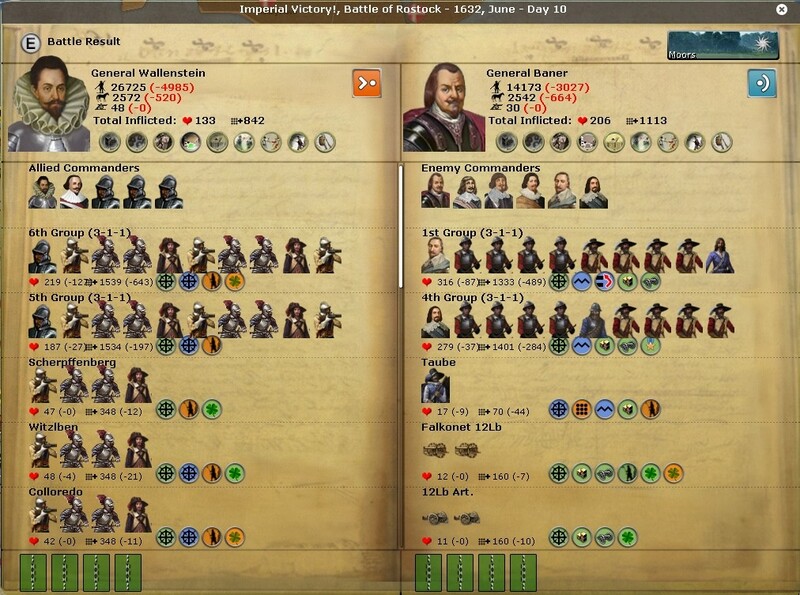 lost nearly 2/4 of his army, Tilly lost much 3/4.. 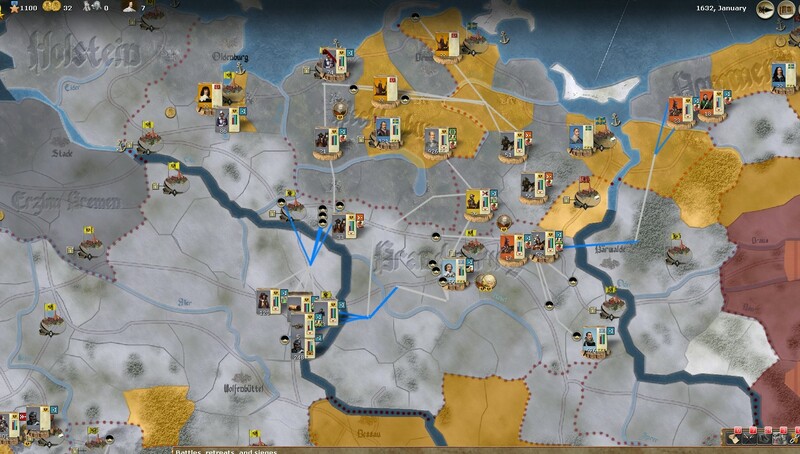 But with 11 turns remaining it is sufficient to protect great VP advantage of HRE. I'll post some pictures.